The small town of Cuevas del Campo lies approximately 18km north west of Baza, in the north east corner of Granada provence. The surrounding countryside is very much agricultural (mostly growing olives), with one of Andalucias largest reservoirs (the Ebalse de Negratin) just 4 km to the south. 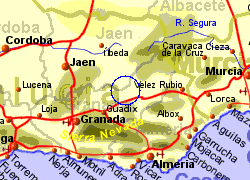 The village lies at arround 800m above sea level, with the Sierra de Baza 15Km to the south rising to over 2200m, and the Sierra de Cazorla 15Km to the north, rising to over 2000m. Cuevas del Campo has a small selection of banks, shops and bars. 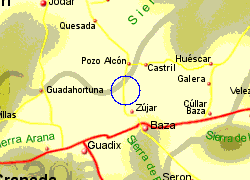 Map of the Cuevas del Campo area.